I've fallen in love with some awesome French designs by Ann Regnier, and we simply had to have them!! All are offered in chart format, and presented in both French and enough English to figure out what's going on... along with those ever-comforting DMC color numbers for the threads!!! 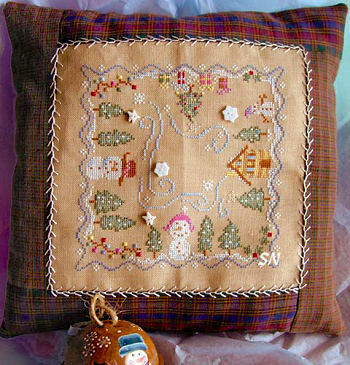 Most of them feature special stitches that are incorporated into the design. In My Basket looks like it is loaded with them, and it IS! Hey, this is a fun little scene! 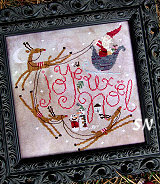 There is a skinny Santa pulling his skinny reindeer, who is attached to a plump little sleigh of presents! 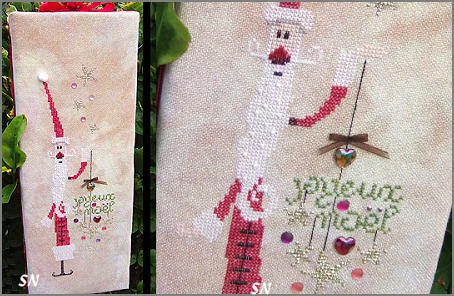 Everything in the instructions is written in French, but I CAN read the 11 colors of Gentle Art Sampler Threads, which are converted to DMC if you have that to work with instead. With a stitch count of 77 x 98, this isn't really very big. Kind of loaded with specialty stitches -- it's a little like a Chessie & Me design, in that all those stitches add so much texture and charm to the small motifs. One of the shop gals thought she'd stitch only the bottom part -- Santa, the deer and the sleigh -- and that would be so cute! Offered as the chart. Well... this is so over-the-top charming... 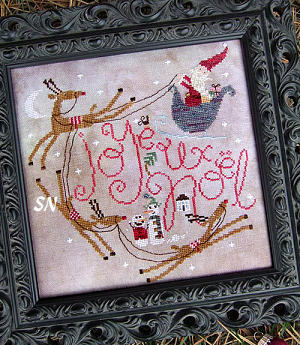 I just LOVE those reindeer, and Santa flying away in that little bubble of a sleigh! 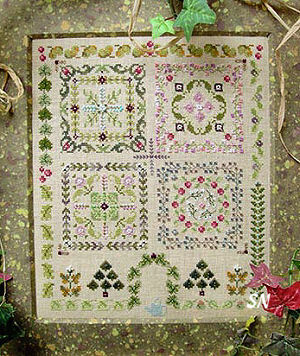 Stitched in Gentle Art Sampler Threads, there are some silver and gold bead embellishments included in this chart. 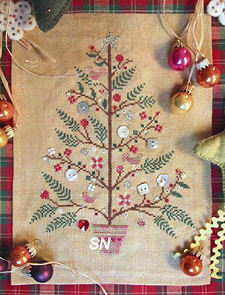 There are Rhodes and Smyrnas scattered here and there, the stitch count is 121 x 128. Such an endearing piece, you have plenty of time to finish it before this Christmas!!! 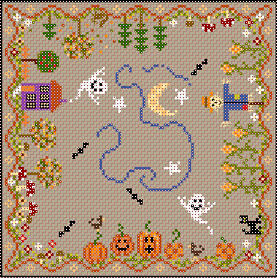 Finishes approx 10 x 13 on 28ct, this is loaded with about 20 different stitches, and has 14-ish colors. It is so free-flowing, it reminds me of a garden of Crewel Embroidery! So over-the-top pretty with a classic and antique feel to me! LOVE, love, love this tree! We don't always have it in stock... but what a dream when we do! 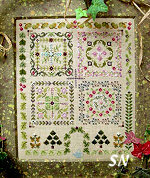 Lacy evergreen boughs decorated with specialty stitches and your stash of special antique buttons, the stitch count measures 107 x 148. Charming, very unique, very pretty. Offered as the chart. 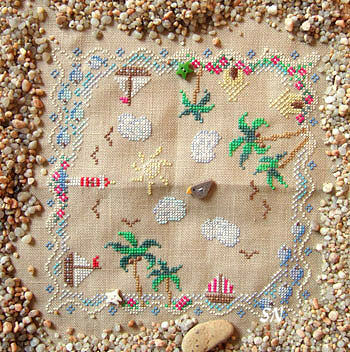 A lovely Herb Garden, this is stitched on 36ct Sand Edinburgh linen in DMC, bits of Kreinik blending filament, some overdyed cottons, and features Mill Hill bead embellishments. There is no English included, but I can figure out the threads... and the beads are called 'perles' ... so I can figure out that, as well! 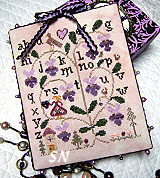 Finishes approx 8 x 9-1/2. Oh gosh, this is a cute Biscornu design!!! Cute as can be, the stitch count is 99 x 99... so fabric size will definitely determine size of your finished cushion. Stitched with DMC and garnished with a couple of JABCO buttons... you could even do this as one long band to put around a basket or something. 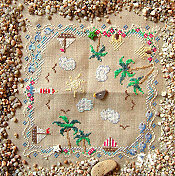 Cute swimming fish, sailboats, palm trees and beach shacks, just a smidge of Smyrna and Satin Stitches. A lavish violet garden, what a fun design! 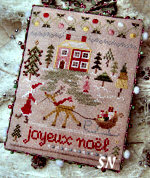 This one is stitched in Gentle Art Sampler Threads, or DMC, and finishes approx 5 x 6 on 32ct. It uses some Spider Web stitches for flowers... but since this one has no English... you might have to let your computer translate some of the instructions. I think the leaves are all Satins, and that you'll be OK. The chart comes with a pretty hand-painted Susan Clark violet flower -- the girl is holding it in the piece. 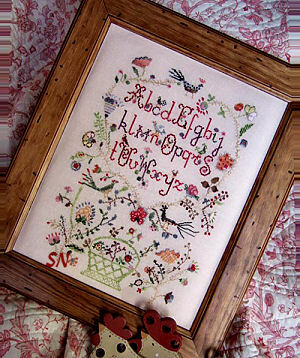 This is a cheerful piece, stitched in Sampler Threads, and is the same size as the Violets. There are some pretty stitches going on, and I can read something in the working about *Pinkeep*, so maybe this is finished as a flat piece, rouched ribbon edging, with pretty pins stored on the backside??? I'm not sure, but actually you could finish this any number of ways, I just love the colors! Another seasonal Biscornu design, this is another one that is so cute! You can't tell from the picture, but in the instructions, it calls for JABCO Jack-o-lantern and bat buttons as embellishments. Some of the pumpkins are done in Eyelets, and this is another that would be fun as one lonnnnng skinny piece! 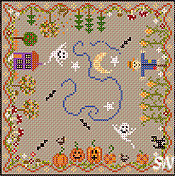 99 x 99 stitch count. Instant Winter! 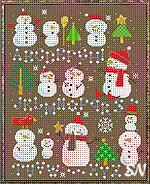 Snowmen, Christmas Trees, a cozy cabin and wrapped presents... another 99 x 99 Biscornu pattern! 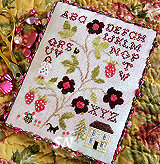 Trees feature French Knot 'berries', the vine uses Rhodes for it's berries, very, very cute! 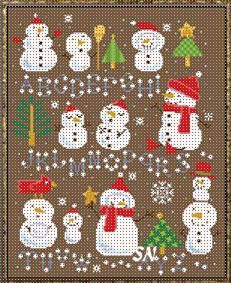 I don't know... but I think that says something like a medley of snowmen -- all of them white! They are just a darling set of snowmen, and I fell in love with all the different faces!!!!! Charted for DMC, the entire stitch count is 141 x 176. 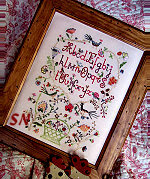 I cannot tell that there are any special stitches in this one, but you could always add whatever you want! Stitch one, or do them all... line 'em up all in one row... whatever!